Healthy Halloween: Just Witchful Thinking? – Erika Brown R.D. When it comes to candy, Canadians definitely have a sweet tooth. Nearly a third of us have it every single day! 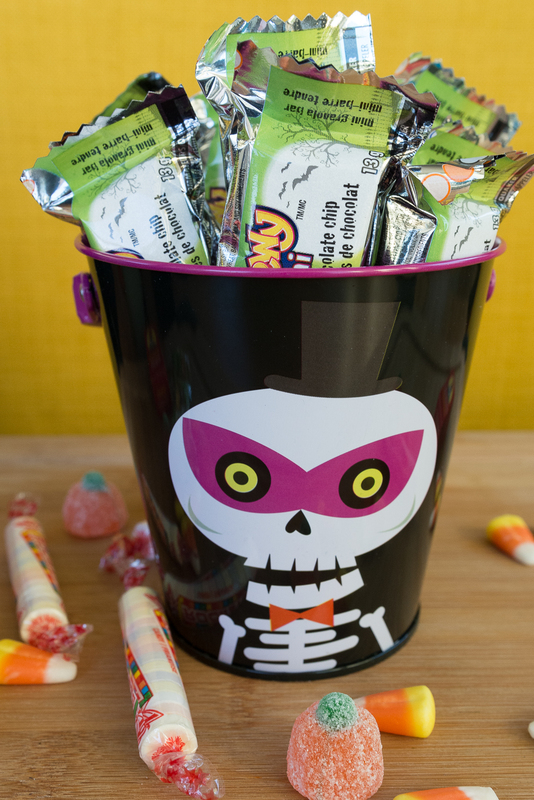 But our daily dip into the candy jar hardly compares to how much we devour on Halloween. Second only to Christmas when it comes to feasting on sugary sweets, Canadians spend $397 million on Halloween treats each year. But what to do when the kids come a knocking? Do you fall into the pattern of caving to their cravings? Or is a healthy Halloween more than just witchful thinking? It’s no secret that excessive sugar intake can wreak havoc on our kids’ teeth and overall health. 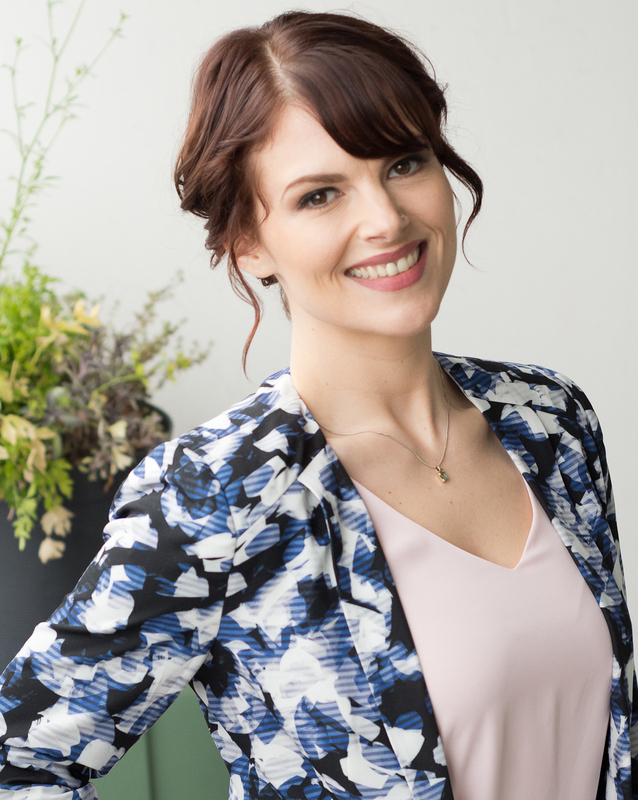 But the scary truth is that healthier options are hard to find in the seasonal aisle packed with brightly coloured boxes of chocolate bars and candy. 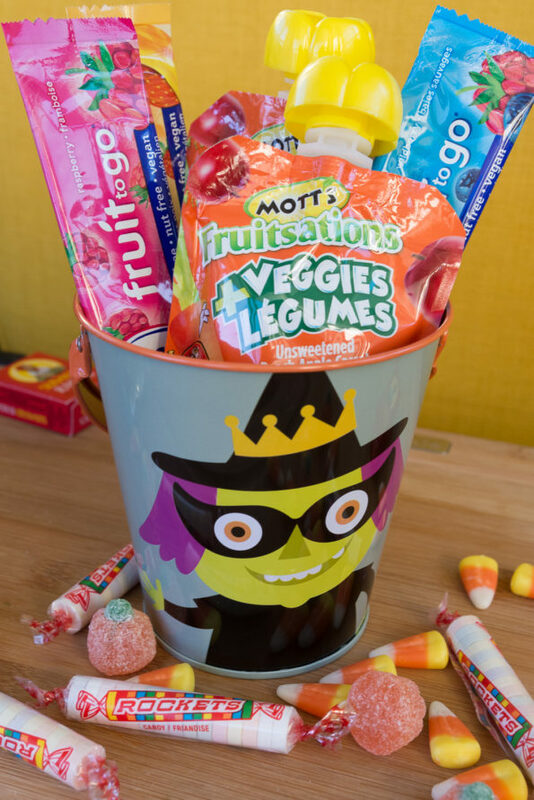 Another reason we shy away from handing out healthier choices is the misconception that children only want candy on Halloween. I assure you this isn’t the case! Each year I dish out healthier options and non-edible treats to pint-sized passer-by. Trust me: the only complaints I’ve heard are from parents, not children! 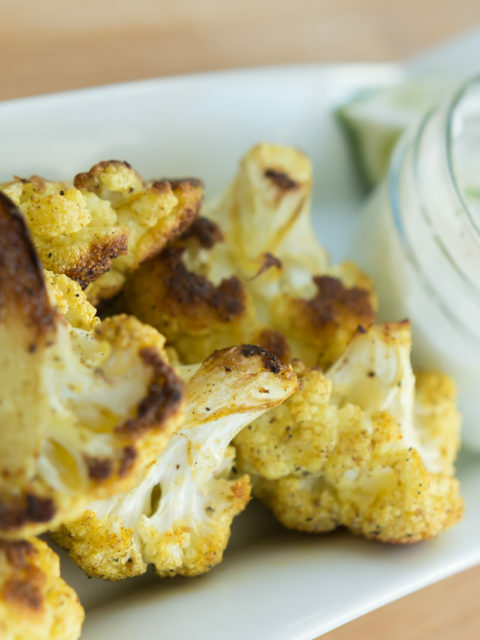 It sounds far-fetched, but children actually like healthy foods. In fact, a 2008 study by First 5 California found that preschool-aged children frequently prefer fruits and vegetables to candy, with broccoli, carrots and apples topping the list. Kids enjoy toys and trinkets just as much as all the edible goodies. According to a study done at Yale University, children were just as likely to choose toys as candy on Halloween when offered a choice between the two. Still feeling bad about depriving trick or treaters of sweets? 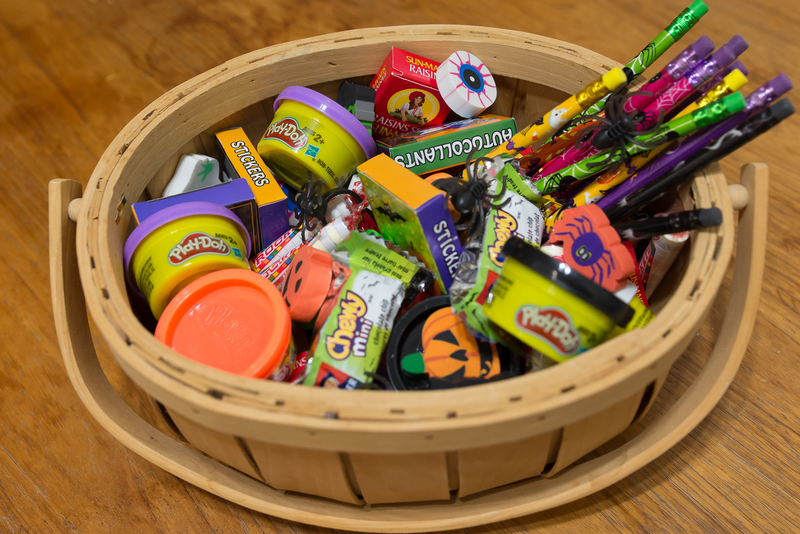 No matter what you do, kids are going to get a ton of candy on Halloween. Why not send them home with items good for something other than rotting their teeth? Or how about something with some nutrition and little to no added sugars? 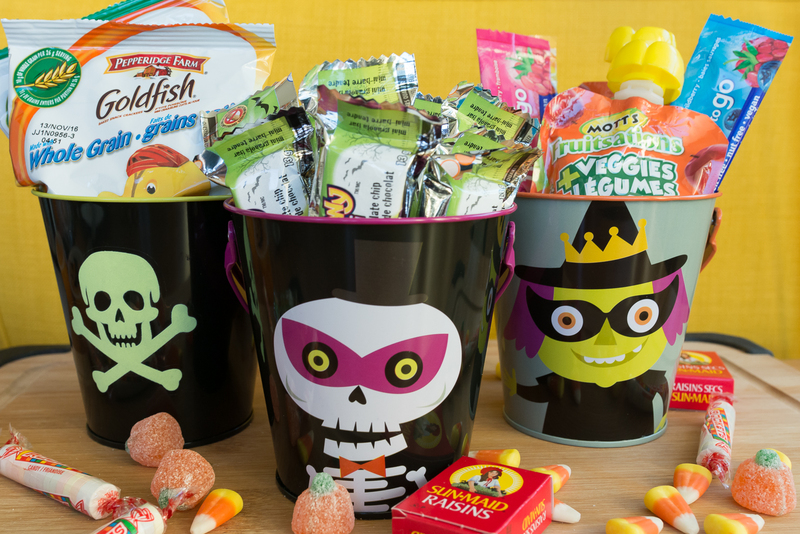 Even if their parents are right, they’ll happily send your treats in their kids lunches once the Halloween candy is long gone. 1) Fruit Leathers and Squeezable Pouches: As long as they don’t have any added sugars, these are a great Fright Night giveaway. Squeezable pouches are made from 100% unsweetened fruit and veggies, contain only 45 calories per pouch and are a good source of vitamin C.
2) Mini Chewy Granola Bars: What’s that you say? Two grams of fibre in two bars? Only 110 calories?! What a great way to satisfy a sweet tooth while sneaking in some healthy rolled oats. 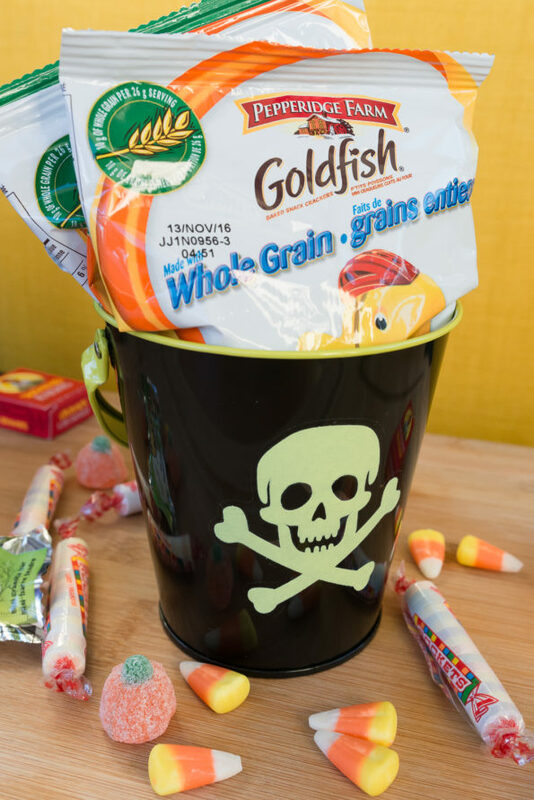 3) Whole Grain Goldfish Crackers: These fun, fishy delights are always a crowd-pleaser. And with no trans fat or sugar and 2 grams of fibre per serving, they’re more nutritious than the originals. Just make sure that whole-wheat flour is the first ingredient before your stock up. 4) Mini boxes of Raisins: These have just 45 calories, no added sugar and are fat free. Plus, a 2013 study found kids felt more full and ate fewer calories when they snacked on raisins versus other snacks. I’m sure I’ll hear from somebody telling me Halloween is only once a year, so we should forget about eating healthy on October 31st. But we all know that the pillowcases of candy last much longer than one night. I’m not suggesting that we ditch the candy-coated tradition completely, but finding little ways to add nutrition and cut down on sugar can make a big difference in the long run. The studies above show that kids deserve more credit than we think when it comes to making healthy choices. If we teach them moderation and how to listen to their bodies, the result may be sweeter than any bite-sized candy bar. What do you think? 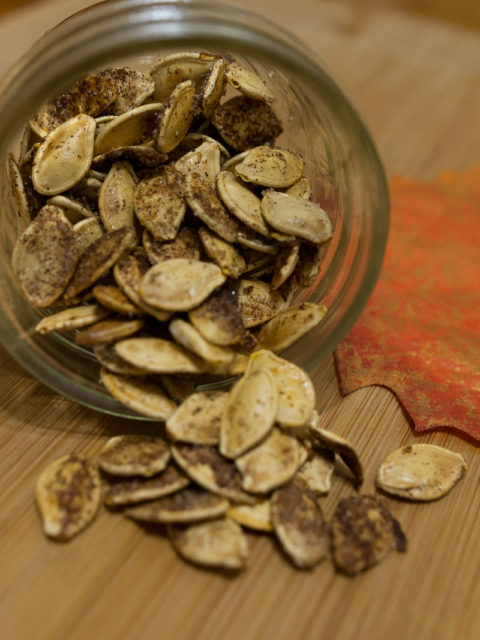 Do your kids get excited about healthier Halloween Treats?